Details: 3 BR, 2 BA Vacation Rental Property, Sleeps 8. 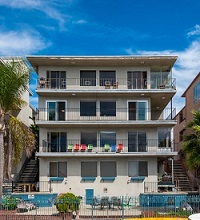 San Diego condo, beach rental in So. California. This is a condo located on the bay. The residence is at street level and the beach is one level below, which you would take the stairs down to get there. The resort home is a few blocks away from restaurants and shopping. The condo overlooks the bay, beach, and the boardwalk. Great bay and beach views from the living room, dining room, second bedroom and kitchen. One large private balcony off the living room to enjoy the most beautiful sunsets. Amenities: this is a secured building that includes a private 2 car parking spot. Washer and Dryer in the unit, there is Wi-Fi, flat screen television, beach chairs, boogie boards, beach umbrella, and beach towels, pack n play, and a booster chair. This property is located near popular San Diego attractions such as SeaWorld, world famous San Diego Zoo, Balboa Park, Seaport Village, La Jolla, Downtown San Diego's Gas Lamp Quarter, Coronado, Del Mar and much more.